In the summer of 2008 an extraordinary article appeared in International Security, one of the premier journals in the field of strategic studies. In a publication mostly devoted to military security, Erica Chenoweth and Maria J. Stephan contributed an analysis of nonviolent action. The paper generated intense interest and is among the journal’s ten most frequently downloaded articles. From the article the authors have produced a book of the same title that expands upon the original analysis and adds several important case studies. The Chenoweth and Stephan study is the first analysis to utilize large-N quantitative methods to compare the impacts of violent and nonviolent methods in bringing about social change. 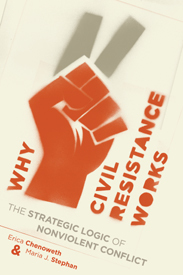 They have developed a Nonviolent and Violent Campaigns and Outcomes (NAVCO) data set that analyses 323 historical examples of civil resistance campaigns that occurred over a span of more than one hundred years. Each case involved an intensive conflict, sometimes lasting several years, in which sociopolitical movements struggled to change regimes or gain major concessions from government adversaries. Comparing the results of violent and nonviolent methods, Chenoweth and Stephan show that nonviolent methods are more effective than armed struggle. In the cases examined, nonviolent campaigns were successful 53 percent of the time, compared to a 26 percent success rate when violence was employed. Nonviolent methods were equally successful in democratic regimes and in repressive dictatorships. The analysis also shows that nonviolent forms of struggle are more likely to produce social and political changes that lead to freer and more democratic societies. The Chenoweth and Stephan book revolutionizes the study of political change. Previously all studies of nonviolent action were based on cases studies or moral reasoning. This analysis shows that nonviolent action is not only the right thing to do morally but is also the most effective method politically. These findings fundamentally challenge traditional realist assumptions about the efficacy of military force and the nature of political power. The authors highlight the significance of political legitimacy and show that the withdrawal of social consent through mass civil disobedience can alter the relations of power. The result is one of the most important studies of nonviolent struggle since Gene Sharp’s landmark volume The Politics of Nonviolent Action (Porter Sargent, 1973). Much of the book is devoted to an analysis of the core factors of nonviolent action that are most responsible for political success. The first and most important factor is what they call the “participation advantage,” the ability of nonviolent methods to mobilize massive numbers of people to participate in political struggle. “Large campaigns are much more likely to succeed than small campaigns,” they argue. As membership increases, so does the probability of success (p. 39). Mass participation “can erode a regime’s main sources of power when the participants represent diverse sectors of society” (p. 30). Mass participation helps to explain why nonviolent movements are more likely to produce democratic outcomes. Nonviolent movements are by their very nature mass-based, participatory expressions of free will. In Poland, for example, the power of Solidarity flowed from the 10 million members it represented and the support it received from virtually every segment of society. The same was true of the United Democratic Front in South Africa in the 1980s. With the participation of churches, trade unions, community organizations and the African National Congress, the UDC was able to mobilize millions and could rightly claim to speak for the majority population. When the movements’ leadership came to power, the foundations for democratic, representative government were already in place. In an armed struggle, by contrast, the resistance is carried out by a smaller, specialized cadre of fighters. An armed insurgency must operate according to military discipline, and its success may depend on the isolation and impregnability of its command structure. In the heat of battle there is no room for debate or dissent. Armed movements are less able to accommodate factions and may turn on themselves in violent purges. Most of the armed revolutions of the twentieth century produced repressive and dictatorial regimes. Those who win by the gun tend to rule by the gun. Chenoweth and Stephan also identify the political dynamics that enable nonviolent movements to undermine the power of often heavily armed adversaries. Nonviolent campaigns are better able than violent campaigns to withstand government repression. In 88 per cent of the cases studied, opposition campaigns faced violent repression from their adversaries, but in many instances this repression was counterproductive and played to the advantage of the challengers. The violent repression of unarmed protest often creates a backfire effect, generating a sympathetic reaction among third parties that increases support for the protesters while undermining the legitimacy and political support of the regime. Nonviolent movements are also more likely to induce loyalty shifts and defections among government officials and within the security forces. Through their analysis of the NAVCO data the authors observe that security force defections increase the probability of a campaign’s success by 60 per cent (p. 58). When resistance campaigns adopt a strategy of armed struggle they diminish their prospects for success and make it easier for the government to use force against them. When soldiers, civil servants, and third parties are attacked violently they tend to close ranks behind the regime and are less likely to shift their loyalties to the other side. Fear and anger within the population may prompt calls for retaliation and generate increased support for government repression. Officials who are under military attack tend to be less likely to negotiate and make political concessions. Chenoweth and Stephan illustrate these and other findings in four major cases studies: the Iranian revolution of 1977-79, the first Palestinian Intifada of 1987-1992, the Philippine people power movement of 1983-86, and the failed Burmese civil resistance of 1988-1990. The case studies are of mixed quality and add little historical detail to what other analyses have provided, but they are useful in illustrating how the key factors of mass participation and loyalty shifts among security forces influenced the political outcomes. If this volume were being written today, it would include a comparative analysis of the Egyptian and Syrian revolutions. The Egyptian revolution mobilized massive numbers (estimates range from 7 to more than 10 million participants) and was mostly nonviolent in nature. It resulted in the first free elections in the country’s history, although its future remains uncertain amidst a troubled political transition process. The Syrian uprising began as a nonviolent movement but quickly shifted to armed struggle, prompting a savage civil war that has caused enormous damage and taken tens of thousands of lives, with little prospect for a more hopeful future. The contrasting outcomes of these struggles seem to corroborate the Chenoweth and Stephan analysis on the superiority of nonviolent methods of struggle. This book breaks new ground in the study of nonviolent action and political science, but it also leaves much unsaid. Nonviolent methods may produce societies that are freer and more democratic (as measured by the Freedom House index), but regimes that are transitioning from autocracy to democracy tend to be highly unstable and prone to violence. The NAVCO data set fails to capture and assess this important risk. The book pays scant attention to the role of political ideology, but it is obvious from the Iranian and Palestinian examples in the book, and from the revolution in Egypt, that political Islam is a major factor driving popular mobilization and shaping political outcomes—not always toward the democratic model Chenoweth and Stephan imply. The book nonetheless offers invaluable insights on the process of social change and the nature of political power and deserves to be widely studied. David Cortright is the Director of Policy Studies at the Kroc Institute for International Peace Studies and Chair of the Board of the Fourth Freedom Forum. The author or editor of 17 books, most recently Ending Obama’s War (May 2011, Paradigm) and Towards Nuclear Zero (Routledge, IISS, 2010) he also is the editor of Peace Policy, Kroc’s online journal. He blogs at davidcortright.net. David Cortright is the Director of Policy Studies at the Kroc Institute and Chair of the Board of the Fourth Freedom Forum. The author or editor of 17 books, most recently Ending Obama’s War (forthcoming May 2011, Paradigm) and Towards Nuclear Zero (Routledge, IISS, 2010) he also is the editor of Peace Policy, Kroc’s online journal. He blogs at davidcortright.net.